The new movie, LEGO® FRIENDS: GIRLZ 4 LIFE, is all about friendship, trusting yourself and standing up for what’s right no matter what the cost. All set to an awesome rock soundtrack you’re going to love! Join Olivia, Stephanie, Emma, Mia and Andrea as they learn that fame isn’t important, it’s your friends that count! Own LEGO® FRIENDS: GIRLZ 4 LIFE on digital HD 1/19 and on Blu-ray Combo Pack and DVD 2/2. Stream LEGO Friends now on Netflix. One lucky Nanny to Mommy reader will win a copy of LEGO® FRIENDS: GIRLZ 4 LIFE on Blu-ray AND LEGO® Friends Pop Star Dressing Room Building Kit. The LEGO® Friends Pop Star Dressing Room allows children to role-play and become their favorite popstar. The set opens up to create different areas with a mirrored vanity and unique accessories to play dress up. Includes Emma and Livi mini-dolls, dressing room with swivel chair, sofa, dog with his bed and much more. Entry is simple. Just follow the prompts on the Rafflecopter below. Open to US only, must be 18+ to enter. Make sure to follow us on Facebook so you can stay up to date with our current giveaways. Good luck! 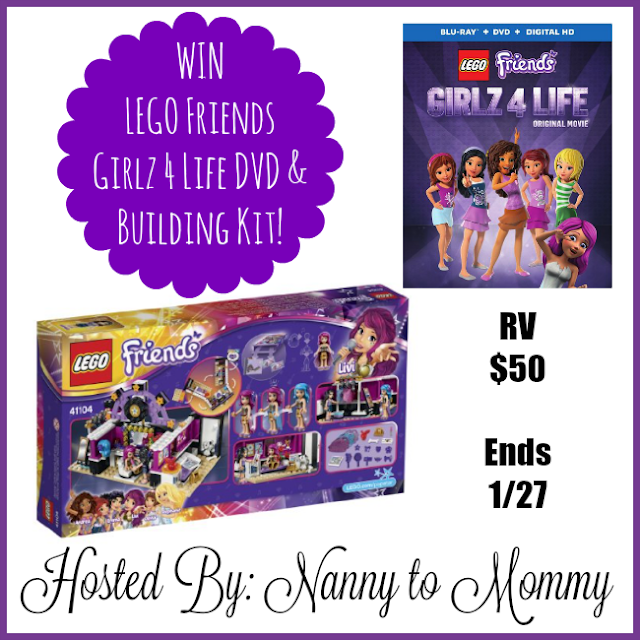 Each household is only eligible to win LEGO FRIENDS: Girlz 4 Life Blu-ray & LEGO FRIENDS: Pop Star Dressing Room Kit via blog reviews and giveaways. Only one entrant per mailing address per giveaway. If you have won the same prize on another blog, you will not be eligible to win it again. Winner is subject to eligibility verification. Nanny to Mommy received complimentary products to provide this giveaway. All opinions are our own. Nanny to Mommy is NOT responsible for prize fulfillment. This giveaway is open to US only, must be 18+ to enter. One entry per household/IP address. No social media was involved in this giveaway in any way. Winner is chosen via Random.org through Rafflecopter. ALL winning entries ARE verified. Winner will have 48 hours to respond with all information in email or another winner will be chosen. If you would like to see your product featured in our upcoming Baby Shower Gift Guide or sponsor a giveaway event, please contact us. I have two daughters - and GIRL POWER is a top topic in my house. Friendship among girls, and sisters, is key to a healthy childhood. I love the positivity of these fab Lego Friends. Thank you for the wonderful giveaway. Girl power for us is focusing on STEM projects as much as the traditional "girlie" stuff. We have LEGO's in the house for Lu and she loves them. Girl power and friendship means a lot to our family because I have two daughters and we are trying to raise them to be confident, hard working young ladies and to be best friends with one another! My house is full of girls so we try to teach them how to be a good friend. We want them to grow up to honor God and Jesus. He is the greatest friend I have. I like the message that Lego Friends is sending. It is telling the girls to stand together to help each other. Girl power and friendship is very important for girls to build their self esteem and allows them to grow into independent strong women. Girl Power and Friendship truly hits home for me right now. My family just got full custody of two of my great nieces. This is so hard on them and it's painful to watch. I have seen these two girls become friends through this, taking care of each other. I am the mother figure in their life now and I "preach" Girl Power to them. It is important to keep up self esteem and remind them of their great worth. Girl Power! I'm really glad this is being discussed. Girls are brilliant, capable, and have so many good qualities. Girls often end up with low self-esteem and backstabbing each other. Girl power is important for girls to realize how strong they all are and band together. I think being a good friend means to put the needs of your friend before your own! Such great lessons here! I have 2 granddaughters that are nearly the same age. They have always been thoughtful of each other. And has always been very close. Friendship is being there for your friends when they need you and also them being there for you! Girl Power is important because girls need to know that they are perfect exactly how they are! Friendship is very valuable to me. I only have a few close friends but that is all I need. They are always there when I need them! Girl power is important in 2016 since girls and women must support each other! Friendship is alway a wonderful thing especially long term friends. My niece really loves Girl Power. She just adores it, and it is very fun. Girl power is a felling of being united and strong we can do anything try to instill it in the girls always. Friendship means so important to me. I have one best friend but we will always support each other.